Pioneer Bank wants to reinvent itself as a digital trailblazer while keeping one foot firmly planted in the brick and mortar channel. 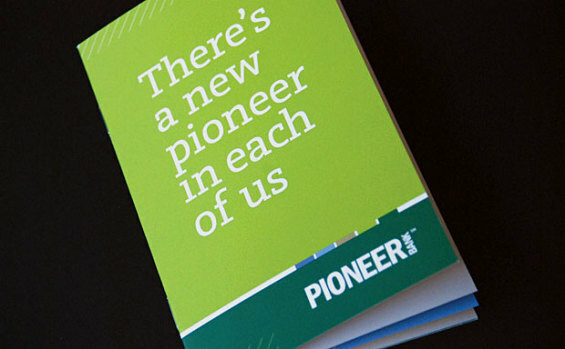 When a bank with a name like “Pioneer” wants to rebrand themselves, it wouldn’t be surprising if they picked a new moniker — something that would distance them from Old West connotations of stagecoaches, cattle rustlers and dusty trails. But rather than change names, Pioneer Bank in Troy, New York ($780 million) had decided to redefine what their name evokes, opting instead to position the organization as contemporary trailblazers, with an array of cutting-edge services and high-tech delivery — pioneers in the new digital world. “Over time, we want people to think of Pioneer Bank as forward-thinking, relevant, and visionary rather than as a nod to a historical figure,” says President/CEO Tom Amell. So move over, Davy Crockett… It’s time to make room for a different style of banking, with branches where customers can ship packages, process photos, and shop for locally made gifts and other merchandise. Proceeds from Pioneer’s in-branch merchandise sales will go to local charities that support services for children within the bank’s communities. The new branch design also positions the bank facilities as “community centers,” with meeting rooms available for local groups. “We want to give people a reason to put their car in park and come in through the front door,” Amell says. With branch traffic across the industry declining by as much as 40%, change is imperative. But as a local community bank, Amell says Pioneer is not going to abandon the brick and mortar channel. Instead, the bank will revamp its 17 branches (an 18th opens in early 2015), putting its technology services front and center so that customers can choose self-service or person-to-person interactions. Pioneer Bank is changing its customer service approach to a universal banker model, in which frontline employees are trained to provide any service a customer requests, from taking a deposit, to shipping a package, to opening a home equity line of credit. The Pioneer strategy assumes that financial services remains — at its core — about establishing relationships with customers, so the bank views its physical presence in the communities it serves is its foremost brand component. In a world where digital delivery often results in a less-personal experience, Pioneer Bank is placing an emphasis on face-to-face contact. 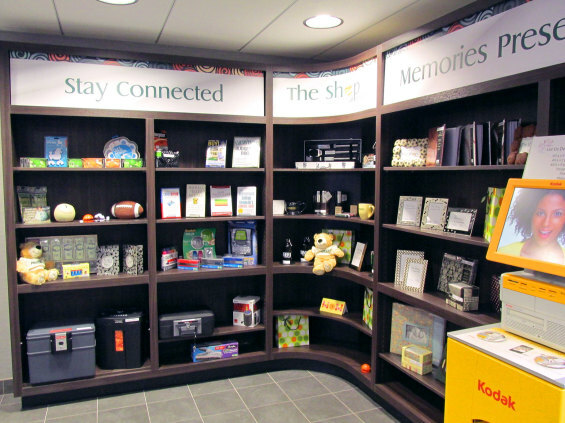 Called “The Shop,” this space inside a Pioneer Bank branch location offers books with financial tips, gifts, picture frames and office supplies, among other items. Notice the Kodak photo printer in the lower right corner. 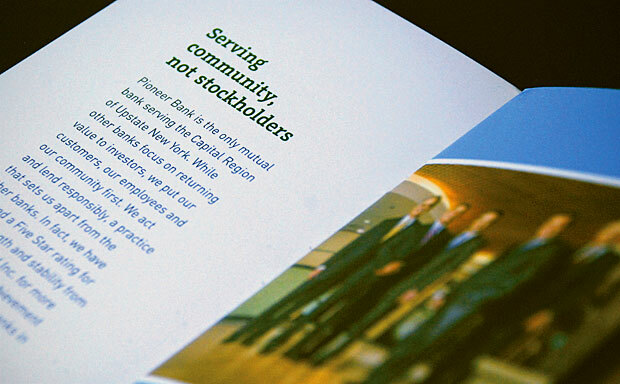 For the messaging and image components of the rebranding, the bank wrestled with its heritage and longevity. Founded in 1889, Pioneer enjoys a strong, solid reputation in the market — a definite plus in a sector where trust is tantamount. Customer research by Burst Marketing, who was brought in to assist with the rebranding initiative, bore out those perceptual challenges. The new brand removes Pioneer’s old tag line “Where Banking is Personal,” which bank executives and their marketing team saw as flat and generic, and focuses on a new brand promise of “Banking for Dreamers, Doers, Movers, and Shakers” and a creative platform based on the statement, “There’s a New Pioneer in Each of Us.” An affinity for innovation is strong in the bank’s market area, which is trying to reposition itself as the next Silicon Valley, Russom says. 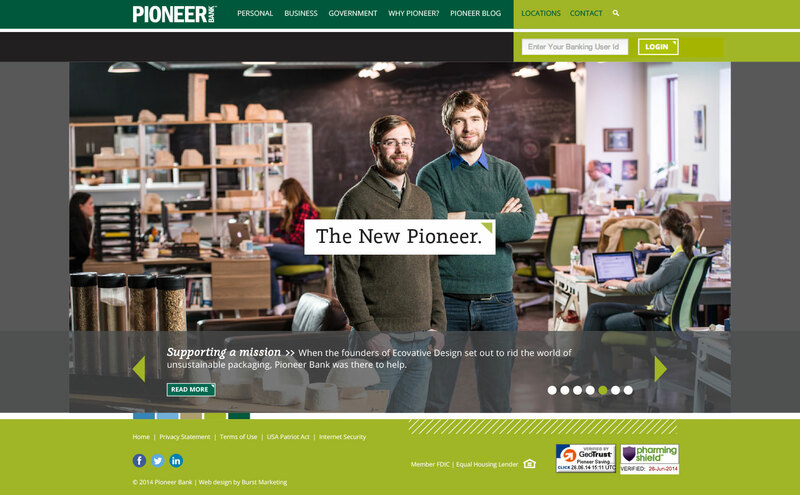 To support its new brand message, the Pioneer website features profiles of innovative business customers blazing trails in health care, manufacturing, construction, and technology. The website also emphasizes the bank’s support for community and charity initiatives. Pioneer’s rebranding project isn’t just cosmetic. It also involves employee training encompassing Pioneer’s key messages and the ways in which the bank wants its staff to sell products and serve customers. Development of an extensive curriculum, called the “Pioneer Institute,” is under way to train staff on service delivery under the universal banker model, sales techniques, and how to live out the bank’s brand promise. “Part of our core culture to support our brand promise is to deliver over-the-top customer service,” Amell says. 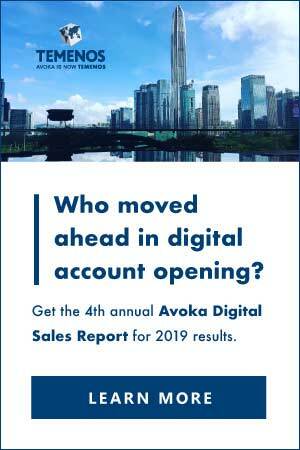 One of Amell’s top priorities when he joined Pioneer Bank in 2012 was to update its brand and positioning in its market, but he says he made a commitment to all staff that before any changes were implemented, he wanted to hear from them. The rollout of the rebranding began with a big employee event this spring, where employees received business cards and lanyards supporting the new messaging. A marketing campaign introducing the new pioneers theme ran from May through August, and Amell says efforts to incorporate the rebranding into the corporate culture and service delivery will be ongoing. 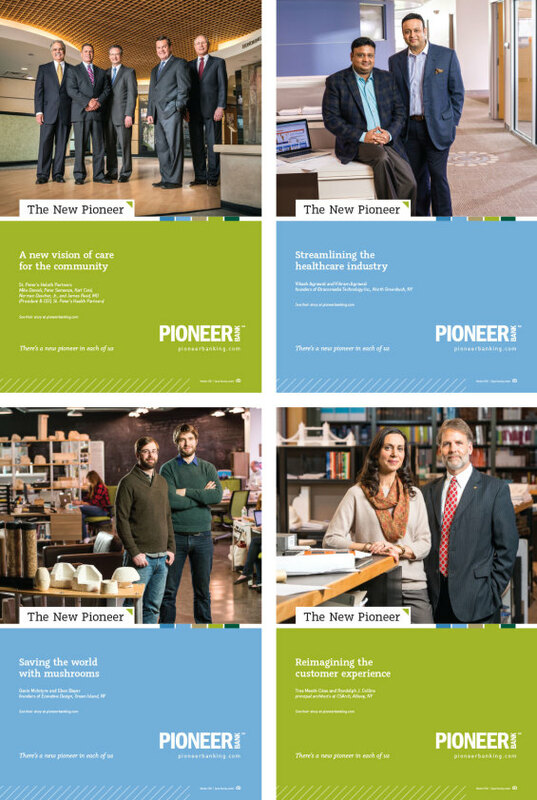 Much of Pioneer’s $500,000 annual marketing budget (which excludes personnel costs) supports the rebranding. To assess the impact of the rebranding, bank executives will be monitoring ROI and other financial metrics and plan to conduct employee and customer surveys, with an emphasis on the extent to which people see Pioneer Bank as current and relevant and how they rate its branch services and mobile and online access. This article was originally published on November 20, 2014 . All content © 2019 by The Financial Brand and may not be reproduced by any means without permission.